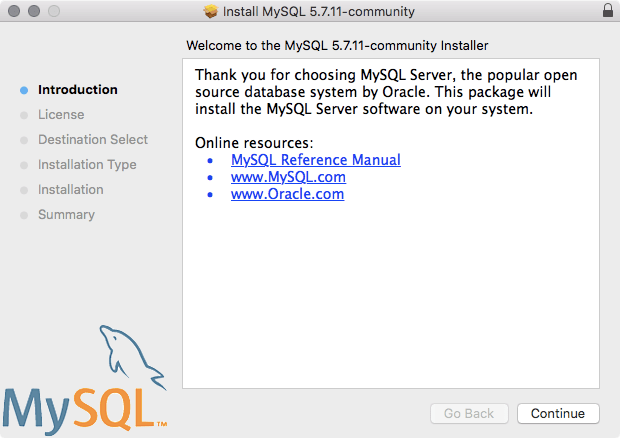 Installing OS X has never been easier than it got in Yosemite, when the installers were moved to the App Store. And since then it’s just gotten easier, and easier. 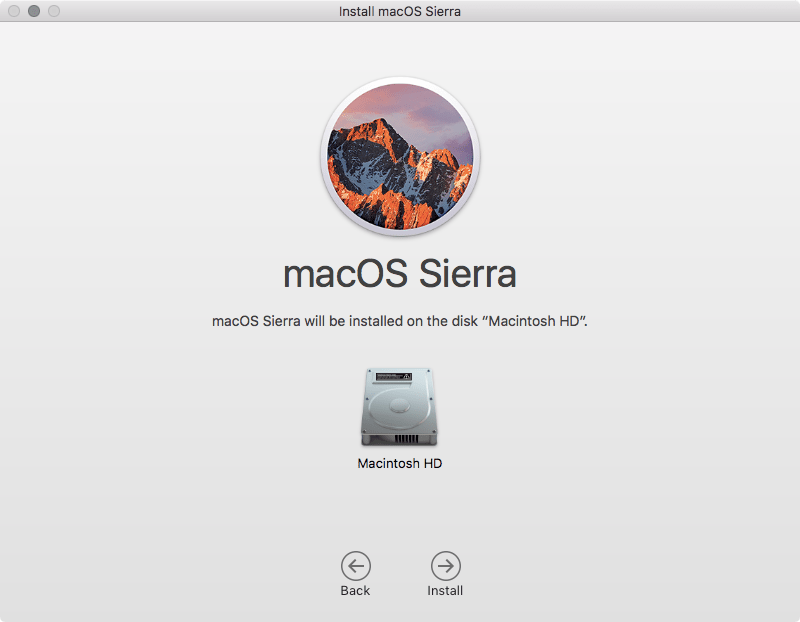 In this article, we’ll upgrade a Mac from OS X 10.11 (El Capitan) to macOS Sierra (10.12), the latest and greatest. The first thing you should do is clone your system (especially if you’re upgrading a server). The second thing you should do is make sure you have a good backup. The third thing you should do is make sure you can swap back to the clone should you need to do so and that your data will remain functional on the backup. 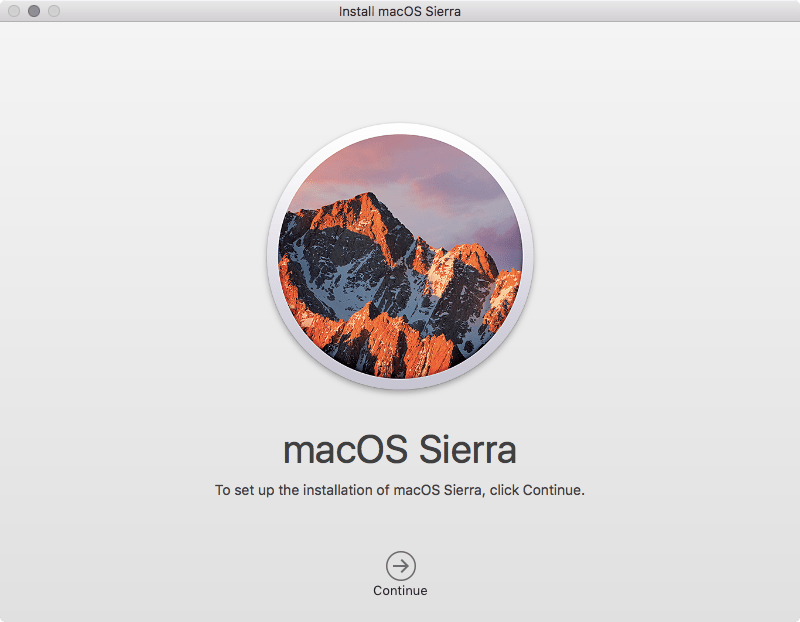 The fourth thing you should do is test that clone again… Once you’re sure that you have a fallback plan, let’s get started by downloading “Install macOS Sierra” from the App Store. Once downloaded, you’ll see Install macOS Sierra sitting in LaunchPad, as well as in the /Applications folder. 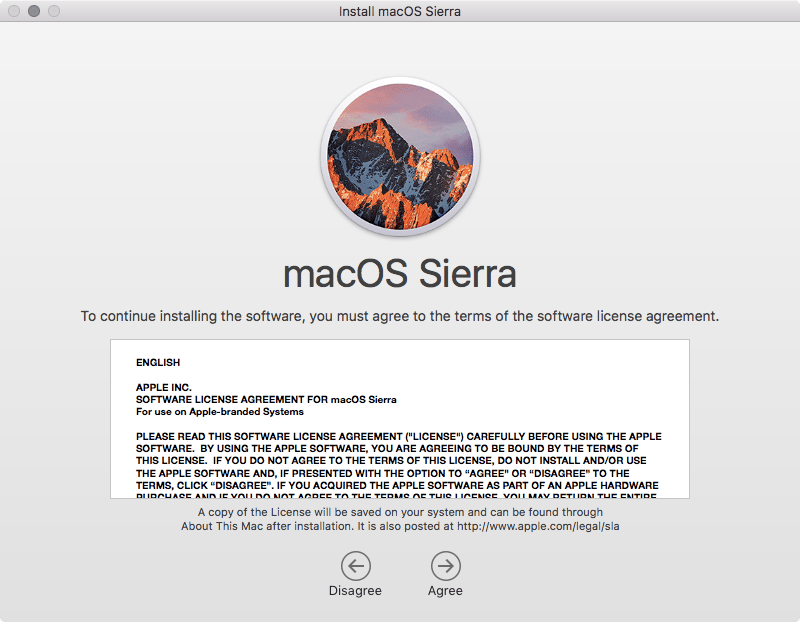 Open the app and click Continue (provided of course that you are ready to restart the computer and install Sierra). 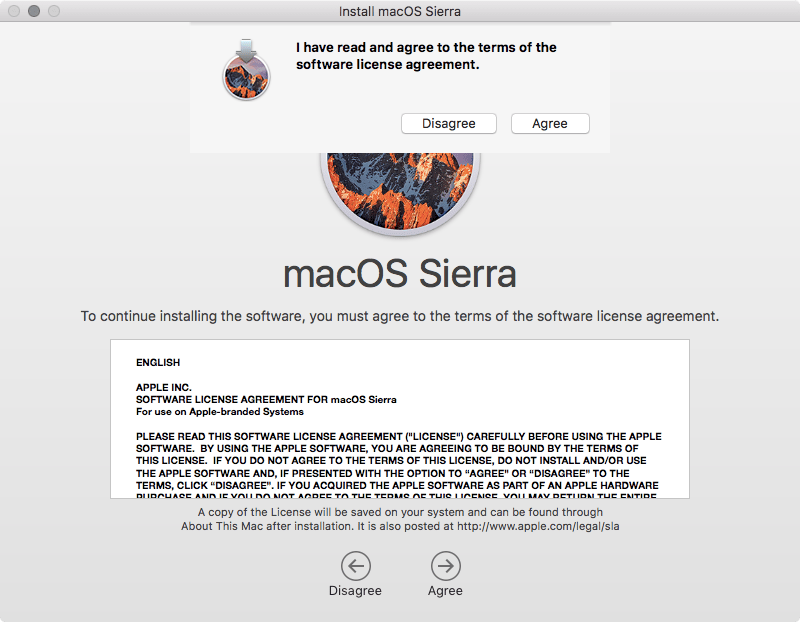 At the licensing agreement, click Agree (or don’t and there will be no Sierra for you). At the pop-up click Agree again, unless you’ve changed your mind about the license agreement in the past couple of seconds (I’m sure it happens). At the Install screen, click Install and the computer will reboot. And you’re done. Now for the fun stuff! 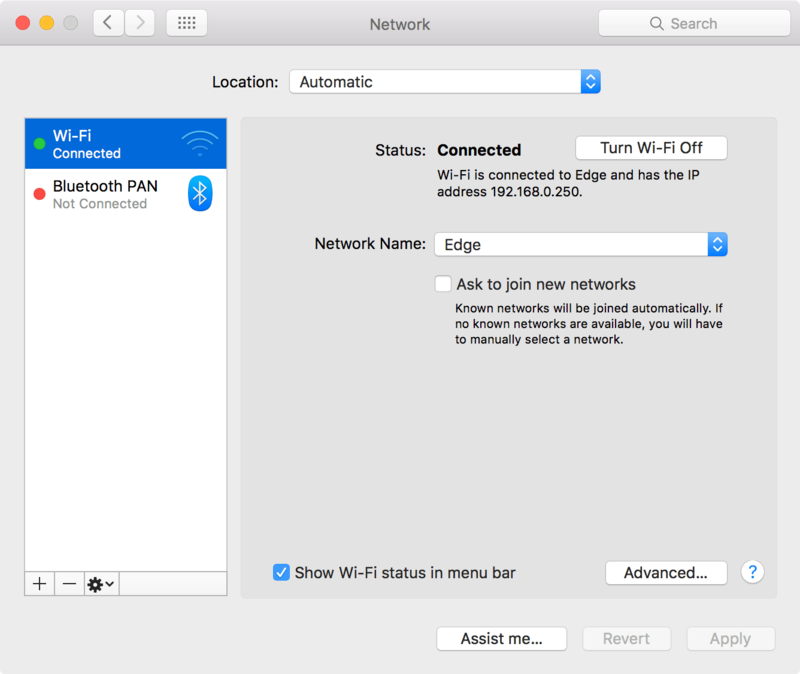 This Mac: Installs the server on the Mac you’re using. 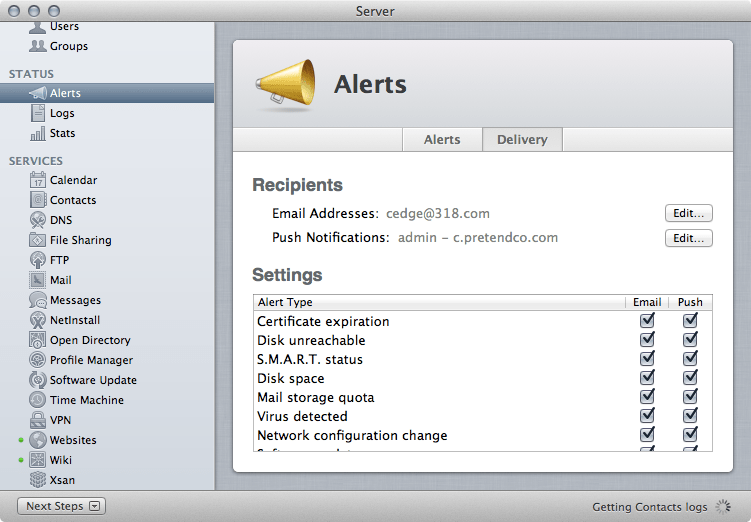 Other Mac: Shows a list of Macs with the Server app that can be remotely configured. Choosing another system does not complete the setup process on the system you’re working on at the moment. Cancel: Stops the Server app setup assistant and closes the Server App. Continue: Continues installing the Server app on the computer you are using. 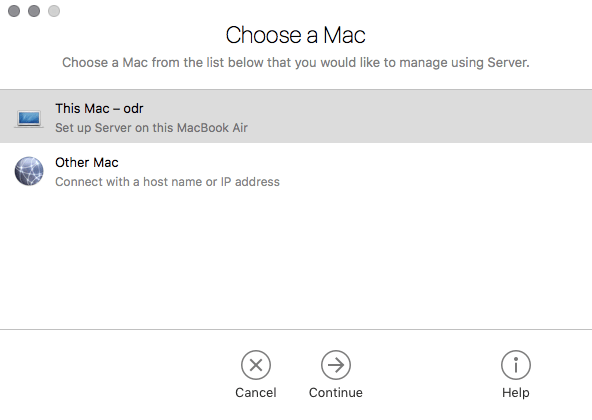 Help: Brings up the OS X Server manual. 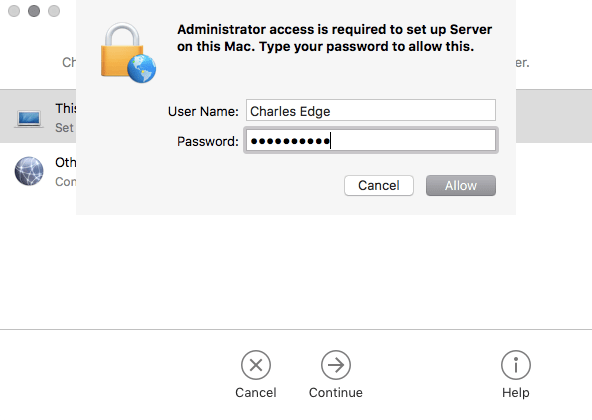 Click Continue to setup OS X Server on the machine you’re currently using. You’ll then be prompted for the licensing agreement from Apple. 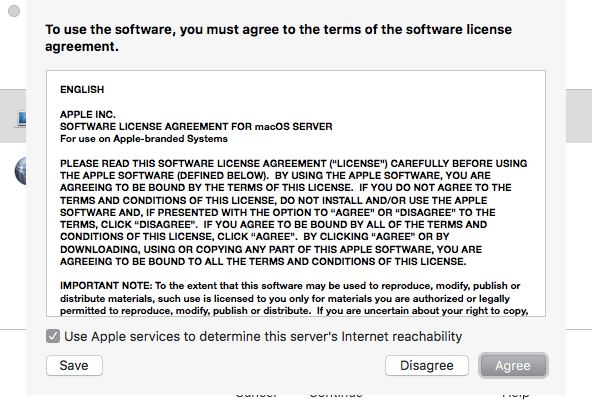 Here, check the box to “Use Apple services to determine this server’s Internet reachability” and click on Agree (assuming of course that you agree to Apple’s terms in the license agreement). Installing OS X Server must be done with elevated privileges. At the prompt, enter the credentials for an account with administrative access and click on the Allow button. The services are then configured as needed and the command line tools are made accessible. This can take some time, so be patient. When the app is finished with the automation portion of the configuration, you will be placed into the Server app for the first time. Your first order of business is to make sure that the host names are good on the computer. Here, first check the Host Name. If the name doesn’t resolve properly (forward and reverse) then you will likely have problems with the server at some point. Therefore, go ahead and click on Edit Host Name… Here, enter the fully qualified address that the server should have. 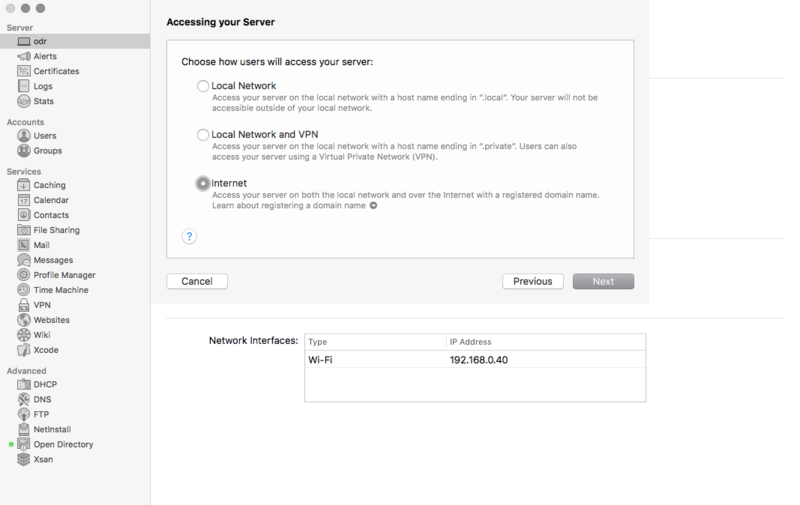 In the DNS article, we’ll look at configuring a good DNS server, but for now, keep in mind that you’ll want your DNS record that points to the server to match what you enter here. And users will use this address to access your server, so use something that is easy to communicate verbally, when needed. At the Change Host Name screen, click Next. 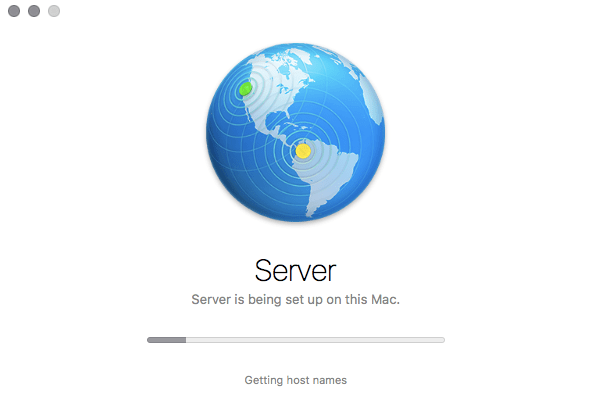 At the “Accessing your Server” screen, click on Internet and then click on the Next button. 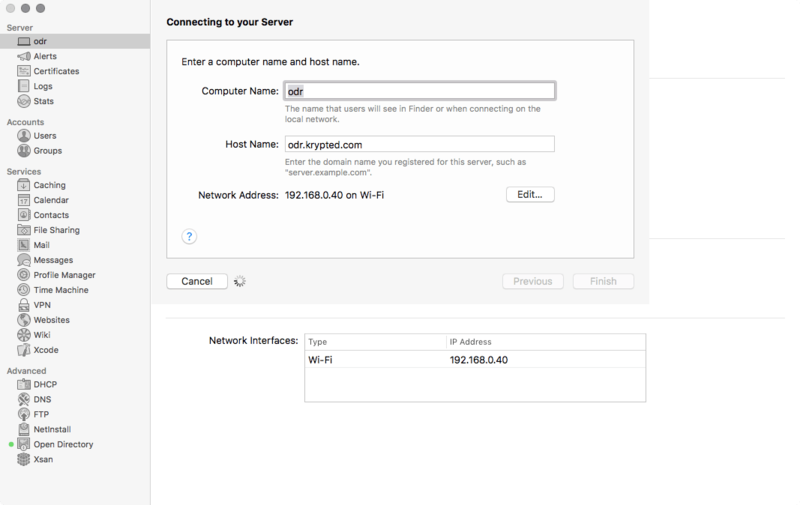 At the “Connecting to your Server” screen, provide the Computer Name and the Host Name. The Computer Name is what you will see when you connect to the server over Bonjour and what will be listed in the Sharing System Preference pane. The Host Name is the fully qualified host name (fqdn) of the computer. I usually like to take the computer name and put it in front of the domain name. 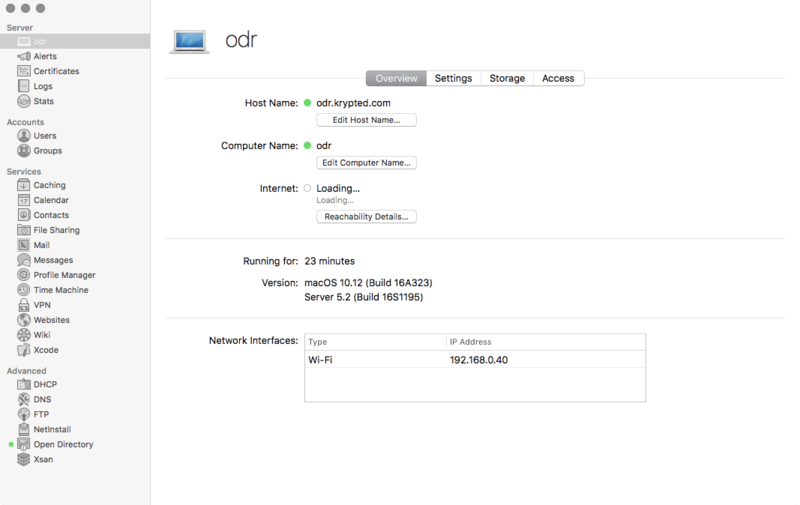 For example, in the following screen, I have osxserver as the name of the computer and osxserver.krypted.com as the host name. Once you have entered the names, click on the Finish button. You are then prompted to Change Host Name. Click on Change Host Name at this screen. 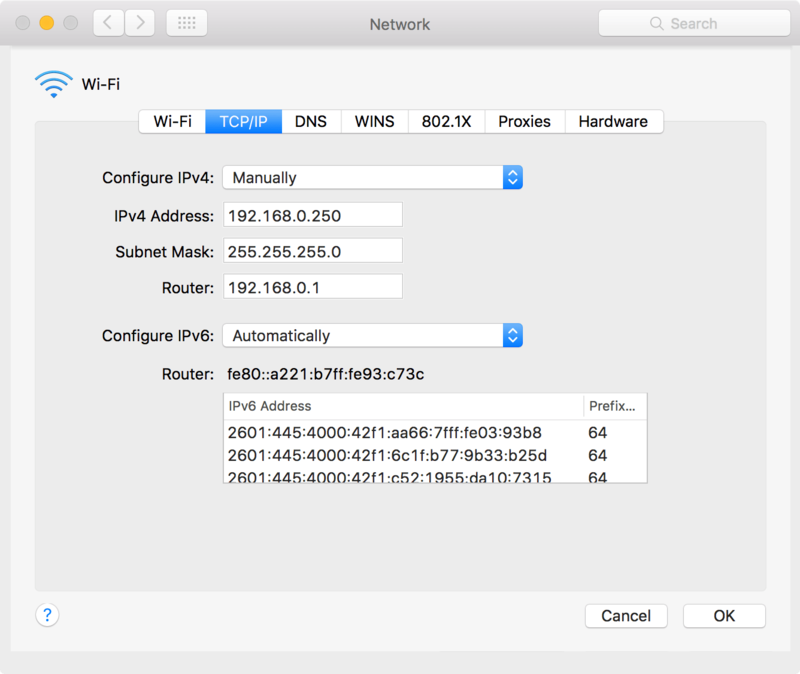 Next, let’s open Terminal and run changeip with the -checkhostname option, to verify that the IP and hostname match: sudo changeip -checkhostname Provided that the IP address and hostname match, you’ll see the following response. 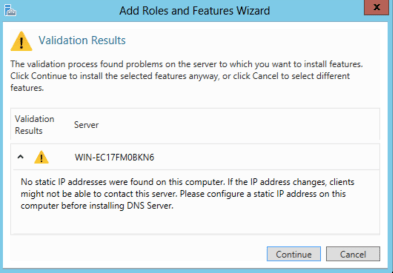 sudirserv:success = “success” If the IP address and hostname do not match, then you might want to consider enabling the DNS server and configuring a record for the server. But at this point, you’ve finished setting up the initial server and are ready to start configuring whatever options you will need on the server. 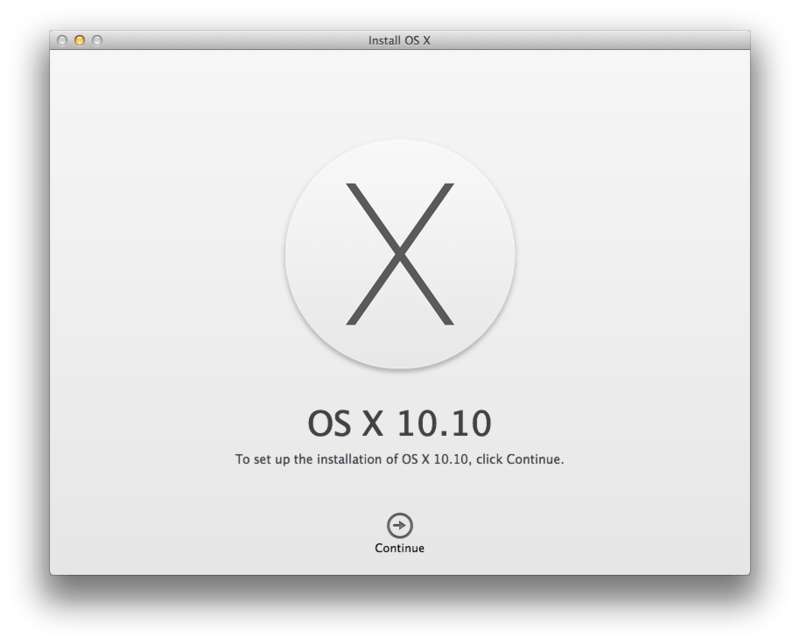 Installing OS X has never been easier than in Yosemite. 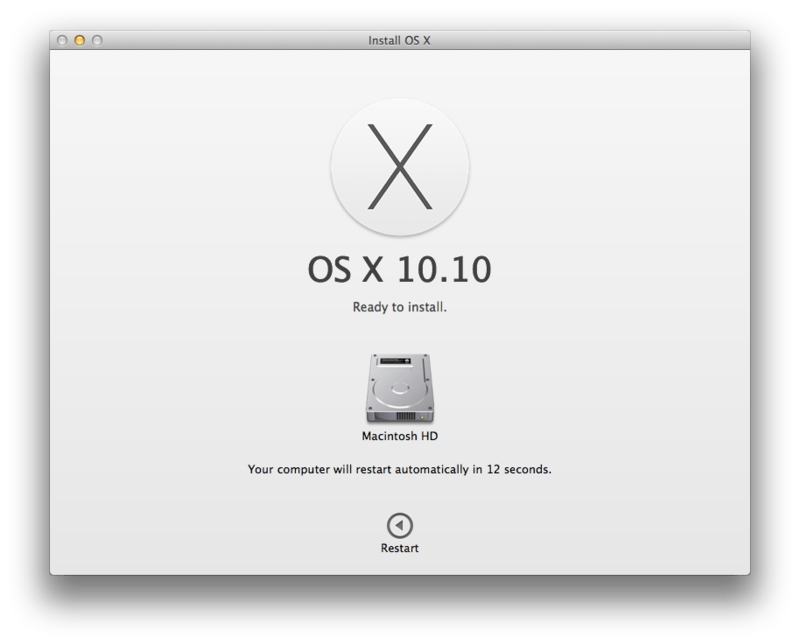 In this article, we’ll look at upgrading a Mac from OS X 10.9 (Mavericks) to OS X 10.10 (Yosemite). The first thing you should do is clone your system. The second thing you should do is make sure you have a good backup. The third thing you should do is make sure you can swap back to the clone should you need to do so and that your data will remain functional on the backup. Once you’re sure that you have a fallback plan, let’s get started by downloading OS X Yosemite from the App Store. Once downloaded, you’ll see Install OS X Yosemite sitting in LaunchPad, as well as in the /Applications folder. Open the app and click Continue (provided of course that you are ready to restart the computer and install OS X Yosemite). 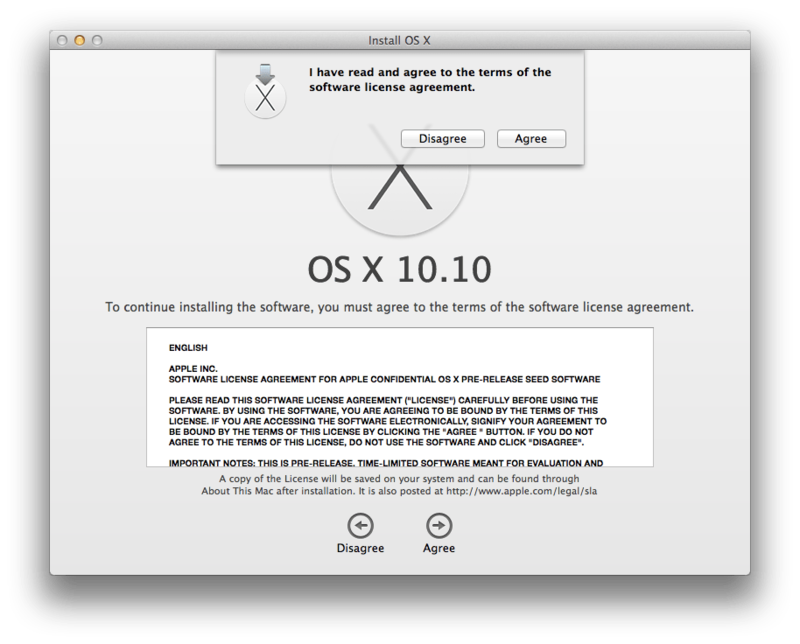 At the licensing agreement, click Agree (or don’t and there will be no Mavericks for you). At the pop-up click Agree again, unless you’ve changed your mind about the license agreement in the past couple of seconds. At the Install screen, click Install and the computer will reboot. And you’re done. Now for the fun stuff! 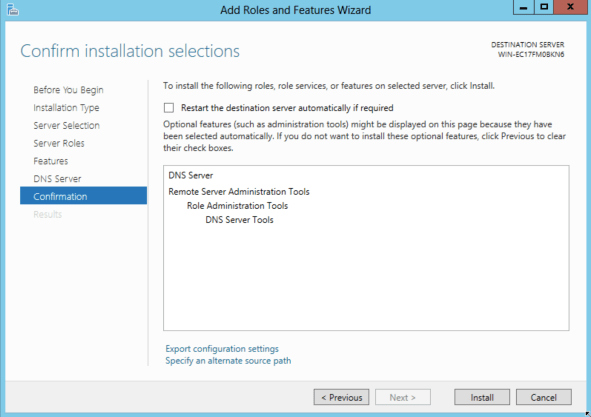 Active Directory Certificate Services Overview This content provides an overview of Active Directory Certificate Services (AD CS) in Windows Server 2012. AD CS is the server role that allows you to build a public key infrastructure (PKI) and provide public key cryptography, digital certificates, and digital signature capabilities for your organization. Active Directory Domain Services Overview By using the Active Directory Domain Services (AD DS) server role, you can create a scalable, secure, and manageable infrastructure for user and resource management, and provide support for directory-enabled applications such as Microsoft Exchange Server. 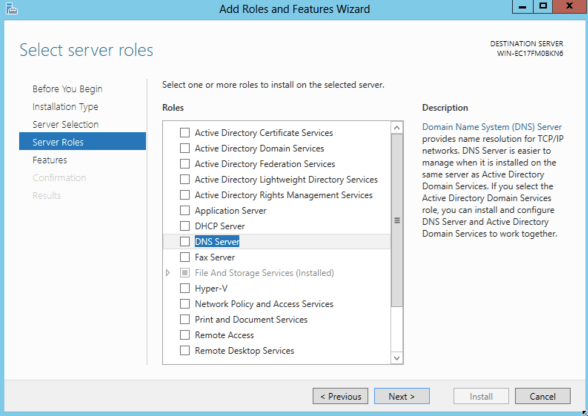 Active Directory Federation Services Overview This topic provides an overview of Active Directory Federation Services (AD FS) in Windows Server 2012. Active Directory Lightweight Directory Services Overview Active Directory Lightweight Directory Services (AD LDS) is a Lightweight Directory Access Protocol (LDAP) directory service that provides flexible support for directory-enabled applications, without the dependencies and domain-related restrictions of AD DS. 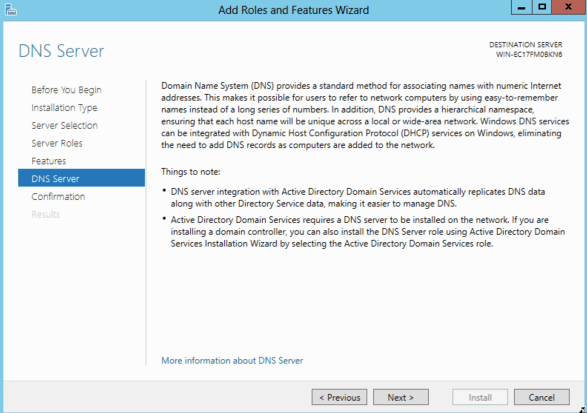 Active Directory Rights Management Services Overview This document provides an overview of Active Directory Rights Management Services (AD RMS) in Windows Server 2012. AD RMS is the server role that provides you with management and development tools that work with industry security technologies—including encryption, certificates, and authentication—to help organizations create reliable information protection solutions. Application Server Overview Application Server provides an integrated environment for deploying and running custom, server-based business applications. Failover Clustering Overview This topic describes the Failover Clustering feature and provides links to additional guidance about creating, configuring, and managing failover clusters on up to 4,000 virtual machines or up to 64 physical nodes. File and Storage Services Overview This topic discusses the File and Storage Services server role in Windows Server 2012, including what’s new, a list of role services, and where to find evaluation and deployment information. Group Policy Overview This topic describes the Group Policy feature in Windows Server 2012 and Windows 8. Use this topic to find the documentation resources and other technical information you need to accomplish key Group Policy tasks, new or updated functionality in this version compared to previous versions of Group Policy, and ways to automate common Group Policy tasks using Windows PowerShell. Hyper-V Overview This topic describes the Hyper-V role in Windows Server 2012—practical uses for the role, the most significant new or updated functionality in this version compared to previous versions of Hyper-V, hardware requirements, and a list of operating systems (known as guest operating systems) supported for use in a Hyper-V virtual machine. Networking Overview This section contains detailed information about networking products and features for the IT professional to design, deploy, and maintain Windows Server 2012. Network Load Balancing Overview By managing two or more servers as a single virtual cluster, Network Load Balancing (NLB) enhances the availability and scalability of Internet server applications such as those used on web, FTP, firewall, proxy, virtual private network (VPN), and other mission-critical servers. This topic describes the NLB feature and provides links to additional guidance about creating, configuring, and managing NLB clusters. Network Policy and Access Services Overview This topic provides an overview of Network Policy and Access Services in Windows Server 2012, including the specific role services of Network Policy Server (NPS), Health Registration Authority (HRA), and Host Credential Authorization Protocol (HCAP). Use the Network Policy and Access Services server role to deploy and configure Network Access Protection (NAP), secure wired and wireless access points, and RADIUS servers and proxies. Print and Document Services Overview This is an overview of Print and Document Services, including Print Server, Distributed Scan Server, and Fax Server in Windows Server 2012. Remote Desktop Services Overview Remote Desktop Services accelerates and extends desktop and application deployments to any device, improving remote worker efficiency, while helping to keep critical intellectual property secure and simplify regulatory compliance. Remote Desktop Services enables both a virtual desktop infrastructure (VDI) and session-based desktops, allowing users to work anywhere. Security and Protection Overview The table on this page provides links to available information for the IT pro about security technologies and features for Windows Server 2012 and Windows 8. Telemetry Overview Find out about Windows Feedback Forwarder—a service that enables you to automatically send feedback to Microsoft by deploying a Group Policy setting to one or more organizational units. Windows Feedback Forwarder is available on all editions of Windows Server 2012. Volume Activation Overview This technical overview for the IT pro describes the volume activation technologies in Windows Server 2012 and how your organization can benefit from using these technologies to deploy and manage volume licenses for a medium to large number of computers. Web Server (IIS) Overview This document introduces the Web Server (IIS) role of Windows Server 2012, describes new IIS 8 features, and links to additional Microsoft and community information about IIS. Windows Deployment Services Overview Windows Deployment Services enables you to deploy Windows operating systems over the network, which means that you do not have to install each operating system directly from a CD or DVD. Windows Server Backup Feature Overview This section provides an overview of the Windows Server Backup feature and lists the new features in Windows Server 2012. Windows Server Update Services Overview Windows Server Update Services (WSUS) enables information technology administrators to deploy the latest Microsoft product updates. By using WSUS, administrators can fully manage the distribution of updates that are released through Microsoft Update to computers in their network. 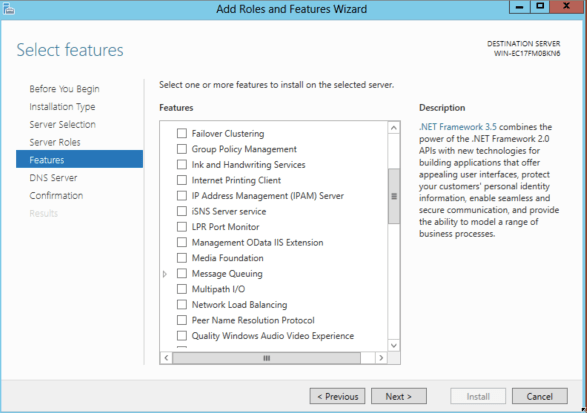 In Windows Server 2012, this feature is integrated with the operating system as a server role. This topic provides an overview of this server role and more information about how to deploy and maintain WSUS. Windows System Resource Manager Overview With Windows System Resource Manager for the Windows Server 2012 operating system, you can manage server processor and memory usage with standard or custom resource policies. Managing your resources can help ensure that all the services provided by a single server are available on an equal basis or that your resources will always be available to high-priority applications, services, or users. To add a Role is a pretty straight forward process. 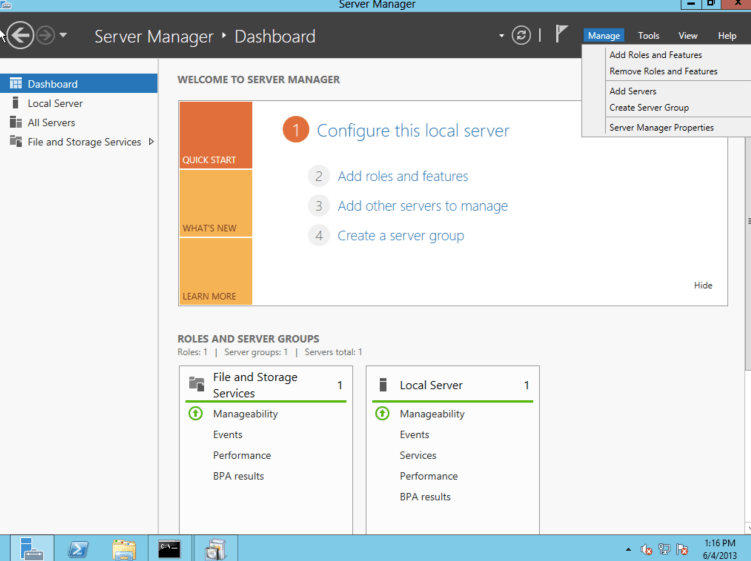 To get started, open Server Manager and click on the Dashboard. From the Dashboard, click on the Manage menu and click on Add Roles and Features. 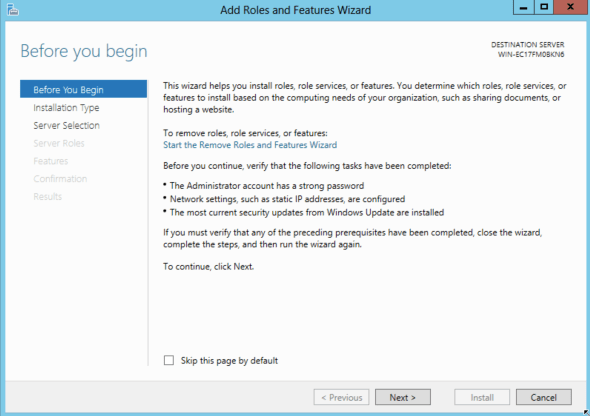 At the Add Roles and Features Wizard click on Next at the Before You Begin Screen. 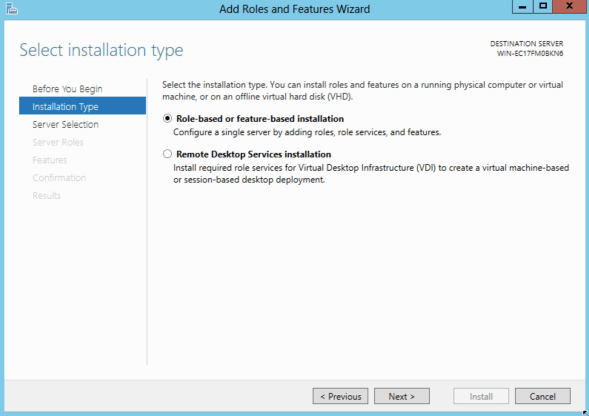 At the Installation Type screen, click on Role-based or Feature-based Installation, unless you are installing Remote Desktop Services (formerly called Terminal Services), then click on that radio button instead. 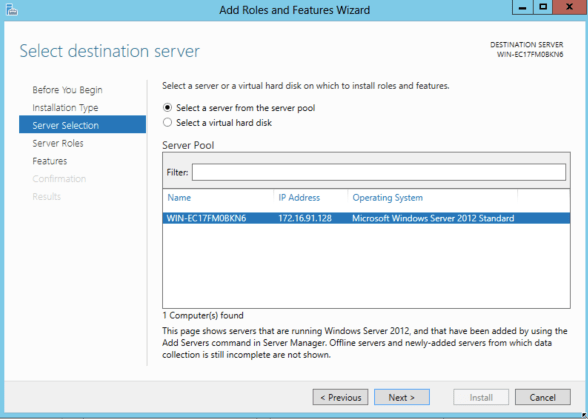 At the Server Selection screen, click on the server you’d like to install the role on and then click on Next. At the Add Roles or Features screen, choose the role you’d like to install. If there are any requirements to use the service, you’ll then be notified that those requirements exist. I usually leave the Include management tools (if applicable) box checked the first time I install a role and click on Add Features. If any issues are encountered, you’ll then be alerted that there was a problem. 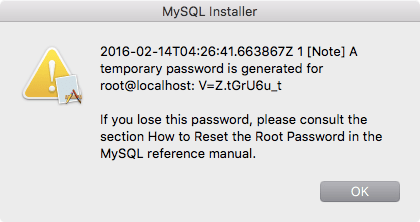 If you’d like to correct the issue, click cancel, correct the issue and then rerun the tool. Or if you’d like to proceed anyway, click Continue. Back at the Server Roles screen, the box will then be checked. Click on Next. At the Features screen, you can add a feature, although in this case we won’t be doing so. Then, click Next. At the screen for the role you just selected, read the information, then click Next. At the Confirmation screen, click Install. Optionally, you can also choose whether to reboot the server when the service is finished installing. Once installed, click Close. 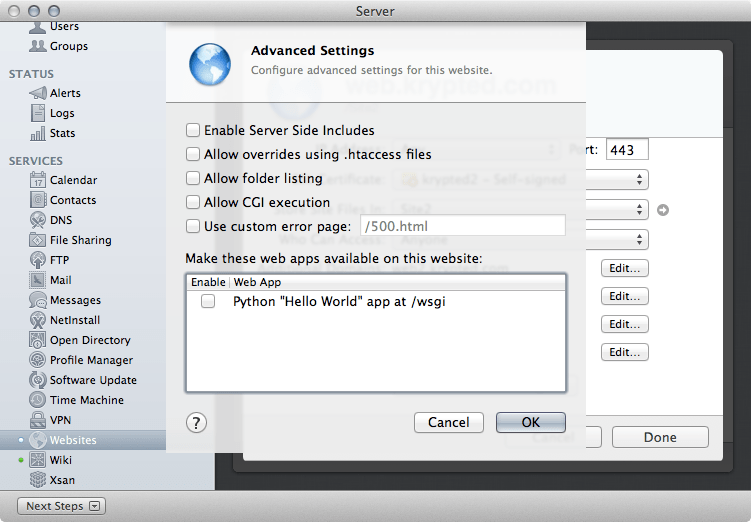 Also, at this screen, you can export the configuration settings for the service for future use. That’s it. 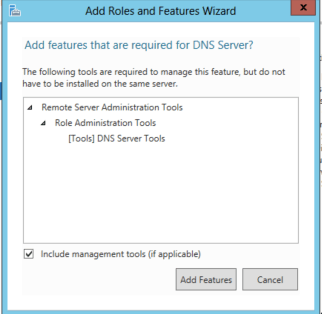 You’ve now installed DNS services in Windows Server (or whatever service you are setting up). The services still need to be configured, but the initial install should now be complete!